Good news: We have three separate storms coming our way in the next 5 days. Bad news: They won't bring that much snow. The first storm will impact the Sierra tomorrow afternoon and bring about 1-3", the next storm will come through about 24 hours later and bring another 1-4" of snow. The final storm looks the most promising, but the models have been pretty inconsistent over the past week handling the 'breakdown' of the upper level ridge (aka Ridgesaurus). The third and final storm's current forecast is for 3-6", but could be susceptible to rain on snow initially overnight Friday into Saturday. The first storm is a classic 2011-current storm. Trough hits a ridge, shifts to the NE, Pacific NW gets most of it and we get the southern end. That is why the snow level is higher and the snowfall totals are low (Figure 1). Figure 1: 3-hour forecast precipitation (in.) and snow level (ft) valid 11/19 at 1pm. Courtesty of DRI/CANSAC. The second storm is a little colder and is taking an interesting trajectory. A broader trough of low pressure splits into two centers (we have seen this once already this year). The southern one hits the Sierra on a quasi NW-SE path (Figure 2). Additionally, the trough digs and deepens to the south and east especially on the lee side of the Sierra (hello PV conservation). This isn't a common trajectory for the Sierra and place north to north west of Tahoe and especially east, won't see much snow. 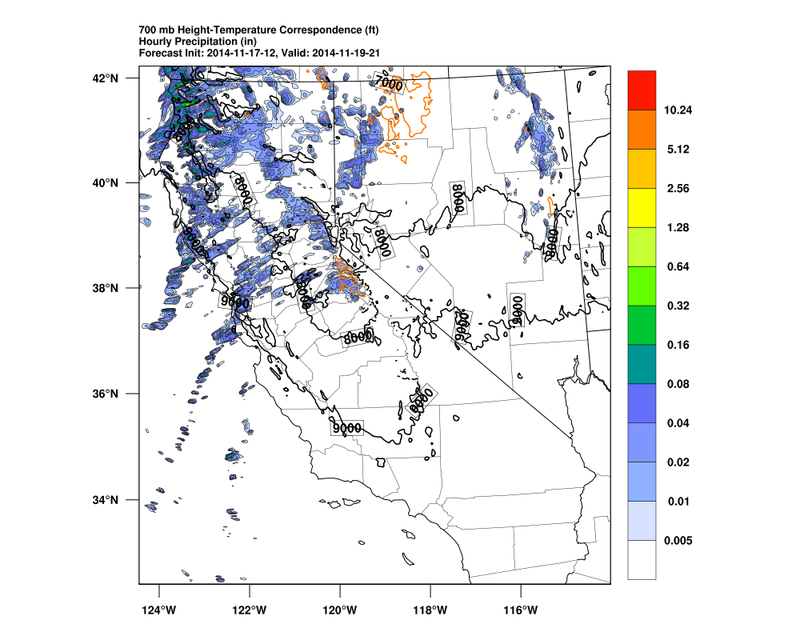 More of it will be confined further south in the central and southern Sierra. Finally, the third storm is a disturbance embedded in mostly zonal (west to east) flow (Figure 3). Due to the zonal nature of this storm, it is susceptible to higher snow levels (i.e. rain on snow) early on with falling snow levels coming later in the morning and afternoon on Saturday. This is something that could bring snowfall totals down and make this storm similar to the previous two. However, the two previous storms somewhat break down the ridge or at least undercut it, moving colder air into the area. A better moisture connection stretches across most of the North Pacific as well (Figure 4). This will bring higher snowfall totals and lower snow levels barring the higher snow levels possible overnight Friday into Saturday. A strong zonal cross North Pacific upper level jet is accompanying the storm, which is a good ingredient for Sierra snowfall (Figure 5). Figure 4: Precipitable water (mm) valid Saturday morning. 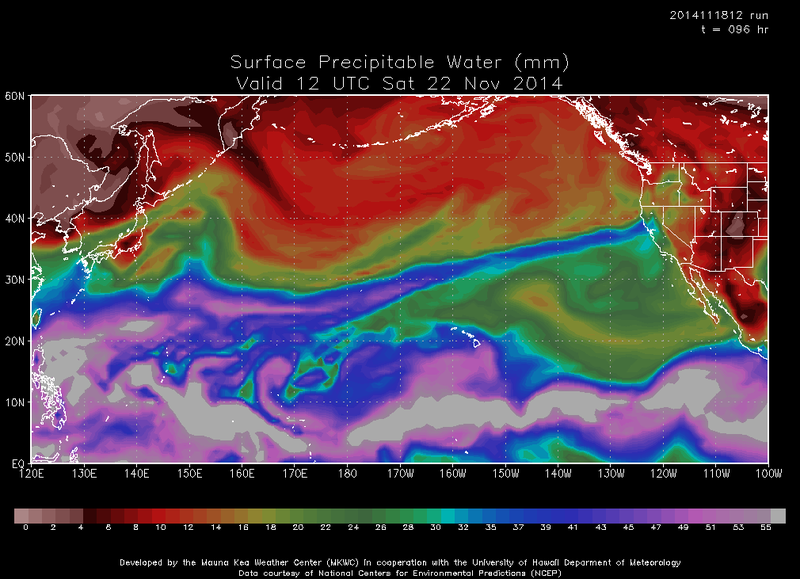 Plume of moisture stretching from SE of Japan to northern California. Courtesy of University of Hawaii. Figure 5: 250mb (upper-level) heights (contoured) and winds (shaded) valid Thursday morning. 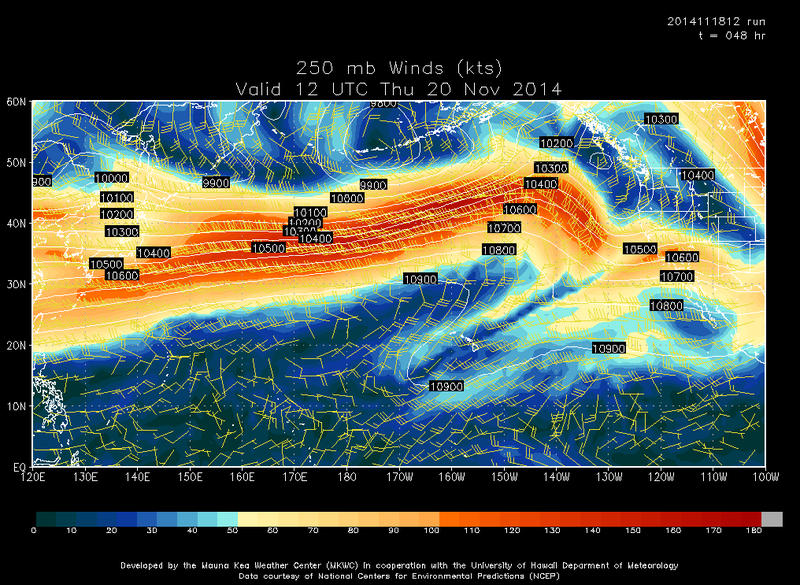 Upper level jet stretching from Japan to West Coast with an Aleutian low forming (ed). Courtesy of University of Hawaii. The pattern is pretty interesting, which is a foreshadow of a future post. However, the here and the now is we have 3 storms coming that will bring at most around a foot to the higher elevations of the Sierra. While it isn't much, it is better than being under the (very stubborn) ridge and watching the little snow we have melt away. Subscribe and get the latest Powdiction updates to your inbox! How a Storm Named Nuri Froze the U.S.